The Principality of Andorra (Catalan: Principat d'Andorra, French: Principauté d'Andorre) is a small, landlocked principality in south-western Europe, located in the eastern Pyrenees mountains and bordered by France and Spain. Once isolated, it is currently a prosperous country mainly because of tourism and its status as a tax haven. 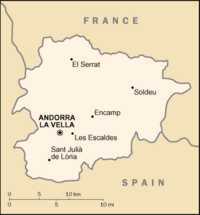 Andorra is also part of the Catalan Countries and is one of the European microstates. Andorra is not to be confused with the Comune di Andora. In 1278, the conflict was resolved by the signing of a parage, which provided that Andorra's sovereignty be shared between the French count of Foix (whose title would ultimately transfer to the French head of state) and the bishop of La Seu d'Urgell, in the Catalonia region of Spain. This gave the small principality its territory and political form. Over the years the title passed to the kings of Navarre, and under the king of France Henry IV, an edict in 1607 established the head of the French state and the Bishop of Urgell as co-princes of Andorra. Sarolta, my daughter and I spent about 3 months travelling around Europe on a Eurail ticket, the experience was awesome and enjoyable. During our roaming all over Europe we visited the small principality of Andorra. We have enjoyed it.